In France there is always food news. Statistics released in early March indicated that French sandwiches, most of them made with baguettes, were outselling hamburgers 8 to 1. What the French could be especially proud of was the continued resilience of the parisienne, a butter and ham on baguette staple. The venerable jambon-beurre makes up 72% of the non-burgers consumed. News was good in general for sandwich purveyors. Growth was 11% last year. Grabbing a sandwich and eating it quickly, it must be noted, is not called “fast food” here. “Fast-food” is a label mostly reserved for anglo-saxon imports. The long-standing, home-grown market (eat a baguette sandwich quickly) has its own name. It's called the marché de l’en-cas. En-cas means literally “in case.” The expression, tough, has come to mean “snack,” i.e. “in case you are hungry.” So, when it comes to the en cas market, the French, anchored by the parisienne still proudly hold their own. This does not mean that the “fast-food” folks are falling behind. McDonald’s of France has been doing well during the economic downturn. It actually plans expansions in 2009. 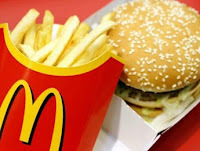 Right now there are 1134 McDonald’s in France. Another 30 are expected to be added in 2009, many looking to the professional and educated crowd by offering unlimited, free WiFi. An offhand comment by the American president about food also made the news. Apparently, Barack Obama asked that Air Force One be supplied with dijon mustard. While not the most portentous of remarks, it caught the attention of another politician, the mayor of Dijon. He put together a gift pack and immediately sent it off to Washington. The mayor faces a major headache. Despite its name, dijon mustard need not be made in Dijon. A 1937 French court determined that the label “dijon” applied to a recipe, not a location. Thus, unlike Champagne which is a protected name in France (only the bubbly made in a particular geographical area qualifies), the mustard can be made anywhere in the world. Even the seeds which make up the basic ingredient come from elsewhere, mostly from western Canada. Because of the economic downturn, the town of Dijon could soon see the disappearance of the last link to the actual fabrication of its famous product, the Amora factory. 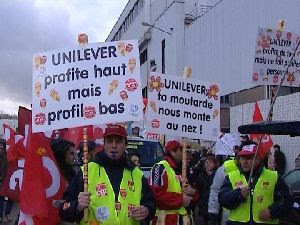 Unilever, the Dutch-British multinational has announced plans to close the factory by the end of the year. Workers have protested and there have been demonstrations in support of keeping the factory open, but the end of a long-standing tradition seems inevitable. One French tradition which does endure is the Guide Michelin. It just issued its 100th anniversary edition. The first edition was published in 1900. This raises the question of whether these people have refined tastes but can’t do simple math. Shouldn’t the 100th edition have been the millenial one? Well, yes, but only if the 20th century had been war-free. Wartime, besides its other bothers, interrupted the Guide’s publication. For this lean economic year, one highlight is the ever popular Bib Gourmand selection. These are quality restaurants which, though not worthy of stars, offer good food at reasonable prices. This year, there are 86 more Bib locations than were listed in the 2008 guide. There is now an almost equal balance between starred restaurants, 548, and Bib ones 527. “Bib” by the way, is short for Bibendum the name given to Michelin’s trademark little tire guy. The “look for food bargains” attitude that marks the Bib selections has sort of taken hold all over France. The economic crisis may have helped the en-cas and the “fast food” crowds, but standard restaurants have seen dwindling customers. Some of them have responded by offering bargain meals, at least during especially slow times. One restaurant in Cherbourg is offering a 5 Euro (about $6.75) lunch special consisting of the main dish and either an appetizer or a dessert. A Lyon restaurant, taking a lead from a British example, does not bother to list prices. Patrons pay what they think the meal was worth. Finally, a tv story recently featured a baker who thinks that any savings should get passed on to the customer. Since the price of flour has come down, he is now increasing the size of his baguette and still charging the standard price of 80 centimes (about $1.00). Now if he were to make a parisienne with his larger bread, that would really be a good deal.